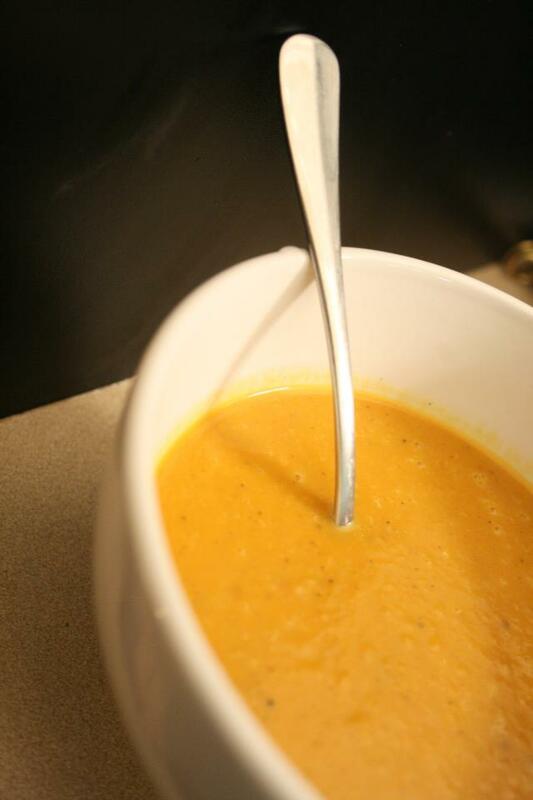 Nothing beats the simplicity and deliciousness of a pumpkin soup as the nights get colder. We have a special trick though. We roast the pumpkin first, intensifying the natural flavours. 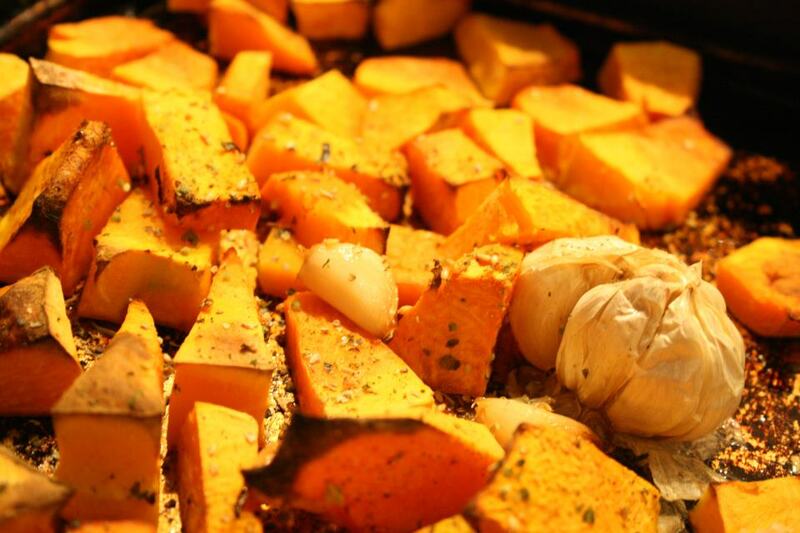 We cook up a huge batch of pumpkin and reserve some for soup and some to toss through salads or add to our main meals. Add a tablespoon of curry paste (such as massaman, green, red, or yellow) or/sprinkle dried herbs over the top/ a sprig of rosemary/ a couple of teaspoons of curry powder. Cut into rough pieces. The larger the size, the longer they will take to cook. Bake on a tray lined with non-stick baking paper at 180 degree Celsius oven for approximately 30-40 mins, until the pumpkin is nice and soft. Get a large saucepan ready on the stove to prepare the soup. Squeeze out the onion from their skins into the saucepan. Do the same with the knob of garlic and discard the skins. Place pumpkin into the saucepan. Add 1.5 Litres of chicken or vegetable stock and bring to boil. Let boil for 5 mins. Remove from the heat and blend with a stick blender until smooth. TIPS: (1) to add creaminess but still keep the recipe low kilojoule, add a can of light evaporated milk (super low in fat) to the saucepan at the end before blending. (2) to make Thai style coconut soup: add curry paste or curry powder when baking the veg and to keep it low in fat, add a can of coconut flavoured evaporated milk to the saucepan before blending. Add a can of normal coconut milk if weight management is not a concern. (4) You can also add cream and mixed herbs to the saucepan before blending if you are doing a western style soup. PLace your pumpkin soup into a large pan on the stove (we used the thai style pumkin soup with coconut milk and curry paste from earlier). In a seperate saucepan boil on high heat the barley and quinoa for 15 mins. Drain. Bring soup to the boil for approx 5 mins. High in protein, containing all of the 9 essential amino acids our body requires. It is very high in the amino acid ‘lysine’ which is essential for tissue growth and repair. High in manganese – an antioxidant to prevent against oxidative damage and has also shown to be able to relax blood vessels. The pungent smell of onions is from the sulfur containing compounds. These are important for our body to manufacture our connective tissue such as tendons as well as our hair and nails. These guys are not some fad, but definately here to stay. Chia seeds are super tiny but very high in fibre which is essential for sweeping our digestive system and therefore preventing cancer. They contain high levels of antioxidants which also prevents cancer, and is good for keeping skin and all the cells of our body healthy. They contain iron, and are high in protein. They also contain Omega 3 oils which are wonderful for keeping skin healthy, reducing inflammation and protecting our heart from heart disease. High in phosphorous, important for strong bones and teeth. It also is involved in turning the fats proteins and carbohydrates we eat, into energy for the body. HOW DO YOU MAKE YOUR PUMPKIN SOUP? DO YOU HAVE ANY PUMPKIN SOUP SECRETS YOU WISH TO SHARE WITH OUR READERS? 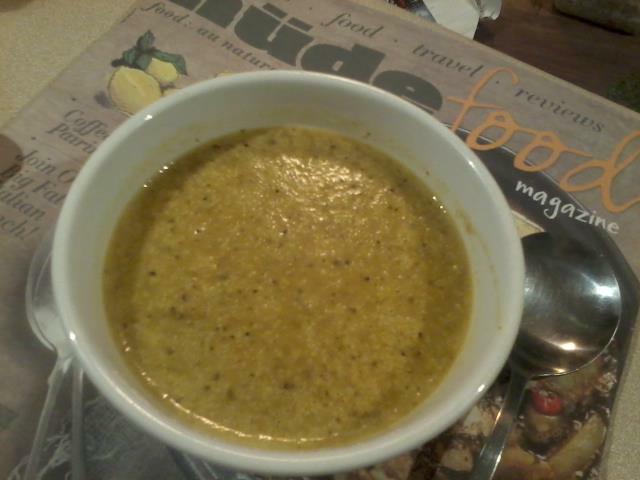 WHO IS GOING TO TRY THE HEALTHY SPICED PUMPKIN, BARLEY, QUINOA AND CHIA SEED SOUP? I think you’ll love it! It’s so fullfilling! Great to hear! Let us know how it goes! It’s full of flavour that’s for sure! I just cooked up a big pot and froze up portions for weekday lunches. I added a 4 cm knob of ginger and a red chilli to the mix as well though to give it a bit of extra kick and it has come up very nice! Oh wonderful! Thankyou for letting us know that you enjoyed it! Puts a smile on our dial! I just made the Thai version with a bit of curry powder on the veg prior to roasting and a can of coconut milk after blending and it was so yummy I had two bowls for dinner! Wow!! Yum yum, sounds delish!